Transpire is thrilled to be recognised as one of the fastest growing companies in Australia for the second year running. 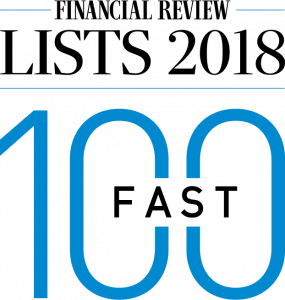 In the 2018 Australian Financial Review Fast 100, Transpire placed 45th thanks to year-on-year average growth of 59.8% over the past three years. “All the credit goes to our incredibly innovative team at Transpire, and our customers who entrust us to deliver impactful technology solutions for them,” said Transpire CEO Luke Smorgon. Over the past 12 months, Transpire has enjoyed rapid growth thanks to the successful completion and continuation of numerous groundbreaking projects. Sir John Monash Centre tells Australia’s story of the Western Front through immersive multimedia installations, Vodafone DreamLab helps fast track cancer research while users sleep, and native apps for Virgin Australia facilitate seamless travel experiences across every touchpoint. As a result, Transpire recently relocated to the heart of Melbourne’s CBD to accommodate an ever-expanding team and to better serve its loyal customers. The coming year promises to provide yet more opportunities to inspire and innovate in the digital transformation space – something Transpire is looking forward to with immense excitement. Now in its 29th year, the AFR Fast 100 provides a snapshot of where growth in the country’s economy has come from, and is going to. To be considered for the list, entrants must have commenced trading before 1st July 2014, and provide four years of turnover data, with a minimum of $500,000 in the first reporting period (2014-15).